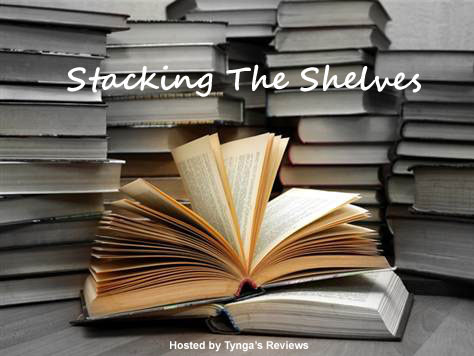 Stacking The Shelves, Vol. 20: Cheers for Bookmail! First of all, a quick apology for the recent inactivity here. Life offline has been hectic lately, so I’ve had to re-prioritize things to focus on the WIP, a couple outside articles that have deadlines, and necessary relaxation. Posts for this blog have slipped as a result. I hope to catch up over the next couple weeks, so bear with me for a little bit. Recently I posted two book recommendation requests at Goodreads. (Consider them part of my “market research” as a fantasy novelist. *wink*) I’ve gotten a few responses so far, but I thought I’d expand those requests to the blog. Feel free to post your suggestions in the Comments below or respond directly to the requests at Goodreads. Fairies in Fantasy Novels: I’m looking for fantasy novels (YA through adult) that feature fairy characters. The protagonist for my current WIP (YA fantasy) and some of her companions are Faeries, and I want to make sure my story offers something different compared to others that have been published. The only fairy book I remember reading is Jennifer Armintrout’s Queene of Light (which is part of a trilogy I’m not interested in continuing, since I didn’t care for Queene of Light). Mermaids in YA Fantasy Novels: I’m also looking for YA fantasy novels featuring mermaids, specifically a female mermaid as the protagonist. I have ideas for a future novel like this, but I want to check out the market so I know how I can set mine apart from what’s already out there.